Sydney hotel operators and owners were the big winners from the strong tourism market in 2016, according to year-end figures from research consultants STR. But room rates fell sharply in Perth and Brisbane while Adelaide hotels saw a flat performance, highlighting a two-paced market that may diverge even further in 2017 with a new wave of supply coming on board. In Sydney, average daily room rates rose $10, or 4.5 per cent, to $221 a night with the city also maintaining the highest occupancy rate at just over 85 per cent. This was slightly ahead of Melbourne, which lifted its occupancy rates marginally from 82 to 83 per cent over 2016. 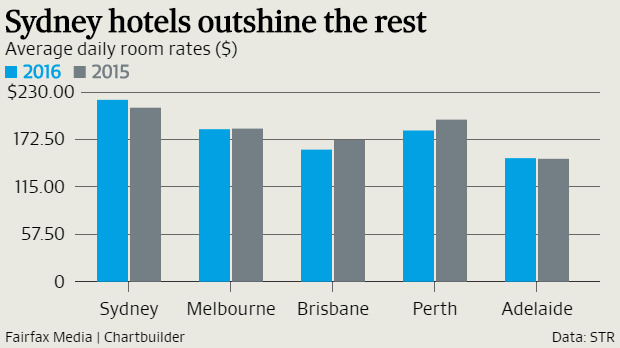 But Melbourne hoteliers were unable to drive any room rate growth with average room rates flat at $185 a night. As a result, Sydney was the only capital city to manage meaningful revenue per available room growth (revPAR, the key performance metric) of 4.4 per cent, ahead of Adelaide, where revPAR rose 2.9 per cent due to rising occupancy rates, followed by Melbourne (0.8 per cent). revPAR in Perth and Brisbane fell 9 per cent over the year. Trent Fraser, chief executive officer at Choice Hotels Asia-Pac, the country’s third biggest hotel group with over 11,000 hotel rooms, said there was “some consistency” in the STR figures and the performance of its own portfolio. “Our feeling is that we have bounced off the bottom in WA and Queensland and that this year will be better than last year. “In Sydney and Melbourne supply and demand are still out of balance, so we have experienced good increases room rates and revPAR in these markets,” he told The Australian Financial Review. But a new research note from Deutsche Bank painted a less rosy picture, warning that resource-exposed cities remain “highly challenging while previously strongly performing cities have experienced moderating revPAR growth”. “The Sydney market is expected to continue generating positive revPAR growth, however growth rates will continue moderating. “Momentum in the Melbourne market has been softening in recent months. There is the potential for Melbourne to be very problematic in about two years as a significant amount of supply is coming on at once,” said Deutsche Bank. Figures from hotel market analysts Dransfield showed a 2.2 per cent increase in national revPAR in 2016 with growth in seven out of the 10 major cities. “We expect [our] national city forecasts to be either maintained or upgraded, however medium term softness is expected in some cities as recovery periods stretch longer than expected in the resource centric locations. “Medium-term expectations to FY2019 are for an average 4.8 per cent revPAR growth per annum across the major cities, constrained by the next wave of supply,” said Dransfield in a new note. Deloitte is forecasting 14,000 new hotel rooms to come online by 2018 but expects demand to grow at twice the pace of supply. “It sounds like a lot of new rooms but with continued demand, this should be absorbed over time,” said Mr Fraser. The key to the demand driver is the tourism boom which is forecast to continue into 2017 with new record numbers of overseas visitors and domestic travellers due to the weaker dollar, a bigger events calendar and investment in tourism infrastructure. Tourism Research Australia forecasts are for international visitor numbers to rise 8.3 per cent this financial year to 8.3 million, led by China, and reach 12.3 million by 2024-25. Domestic visitor nights are forecast to reach 432 million by 2024-25 up from 340 million currently, according to TRA.”There’s huge potential from China. We’re seeing more Chinese travelling individually and in family groups in Australia. They are getting out of the cities and heading out to our regional properties as well,’ Mr Fraser said.